The 7th Annual Reef/Sweetwater Pro-Am Surf Fest will be held from July 15-17th on Oceanic Street, in Wrightsville Beach, North Carolina. This year’s event features a $20,000 pro prize purse. 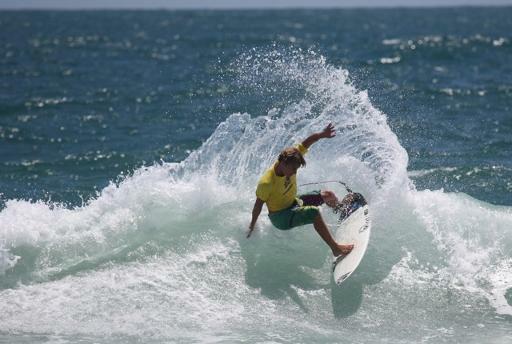 The Surf Fest is one of the largest surfing contests on the East Coast and attracts surfers from around the world. Former event champions include pro surfers Rob Machado, Aaron Cormican, Asher Nolan, Michael Powell, and Jeremy Johnston. Returning to this year’s event is former ASP World Championship tour standout and Wilmington Sports Hall of Fame inductee, Ben Bourgeois. Other notable pros competing in this year’s event include Rob Machado, Mike Losness, Paul Fisher, Jay Thompson, Tonino Benson, Dylan Goodale, Michael Dunphy, Thiago Camarao, Ford Archbold, Luke Davis and Heath “Nutty” Walker. In all, 96 professional surfers from around the world will descend on Wrightsville Beach to surf in the 3-day event. Amateur divisions include Guys 15 & Up, Guys 14 & Under, Guys Open Longboard, Girls Open, Girls Open Longboard, Guppy division- a crowd favorite featuring young, beginning surfers, and the Tow-At Expression Session. This year, a Music & Art Festival has been added to the event on Saturday, July 16thfrom 4pm to 9:30pm in Wrightsville Beach Park. Local artists along with musicians Selah Dubb, Fuzz and Mac, and Rob Machado with Jon Swift will entertain the crowd. Games, activities, and good food from Tower 7 will make the evening a family friendly event. These events are made possible by the following sponsors: Action Sports Now, Reef, Sweetwater Surf Shop, Wblivesurf.com, Red Bull, Spy, Dakine, JS Surfboards, Marine Warehouse, Suzuki, Carolina Skiff, Kona Brewing Co., Cape Fear Land Rover, Skull Candy, Stance, Eastern Surf and Skate Supply, WB Surf Camp, Tower 7, Café Del Mar, King Neptune, Red Dogs, A&M Screenprinting, Frank Williams Building Company, Eastern Surf Magazine, Clif Bar, The Clontz Newkirk Real Estate Group, Hampton Inn, Vito’s, Scuba Now, Marcello Caliva/Intracoastal Realty, Wilmington Oral Surgery, and Clean Energy Events.